G Wiv wrote: Pigmon, aka Rob Lopata, shares his wealth of Carne en su Jugo knowledge with Kevin Pang of the Chicago Tribune. The two restaurants mentioned in the article are Birrieria de la Torre and Las Cazuelas. Las Cazuelas serves a pretty good carne en su jugo but in my estimation there's a big gap between theirs and the elite version at de la Torre. Excellent point. The murkier, more rustic broth in the very good bowl of CESJ at my neighborhood joint, El Taco Veloz, is arguably (and I say that tentatively) beefier than that at De La Torre, but as an avid stock-maker, I greater appreciate the clarification and delicacy of the consommé in the CESJ at De La Torre. This is literally the closest restaurant to my house (there were a couple marginally closer, since closed), and has had at least four names in the sixteen years I've lived here. This is the first time that Carne en su Jugo has been on the menu, though. So having memory of this thread, I had to try it. MrsF ordered the Flautas special (they have a lenten potato version on special too) for $6.95. CesJ is $8.95. The Carne en su Jugo was very tasty: more bacon than I'd anticipated, and probably made it a little saltier than I like most soups. Several slices of avocado, an onion and cilantro relish (if there were radishes or chiles de arbol, I didn't especially notice them, but I wasn't looking for them, not having read PIGMON's analysis until after the meal -- a little extra heat wouldn't have hurt). The broth is very rich, and I'd have to classify it as a "red" variety, looking very similar to Rene's pic at Tahuaya. Pinto beans, bacon, and bits of grilled steak make up the majority of this soup. Portion is decent sized -- not a pho-cauldron, but not a little cereal bowl either. I don't think this place is Jaliscan, one of their other specialties is "Cesina Estila Guererro". Table salsa is a flavorful thick, tart tomatillo variety, squirt bottles of hot red and green also were served. The menu says homemade tortillas but what I had tonight definitely wasn't. I'll be back for the CesJ, and other items. I am admittedly a CESJ newbie--but feeling under the weather this weekend and craving a healing bowl of something, this sounded like just the thing. Was in NWI so corralled the family to go to Memo's Taco Mex and was rewarded with a steaming bowl of the "green" version. Great flavor though no real heat to speak of (I think that's typical, right?) and a nice texture to all components. Beef was in small strips, definitely the dominant component along with the pureed blend of "green"--if there was jalapeno in it is was extremely mild. Beans and bacon were noticeable and rounded out the flavor but didn't compete with the beef. Grilled whole green onions were incorporated into the soup. Cilantro and chopped onions were served on the side. I enjoyed it (as I have pretty much everything I've ever had here) but am now curious to try the red and clear versions. For anyone seeking soup therapy who find themselves in the vicinity, I would say that the CESJ at Memo's hits the spot. And it's on the menu daily. Now I understand. I have a lot to learn. backorforth wrote: Now I understand. I have a lot to learn. PIGMON wrote: WARNING: Major downhill alert. A starter-kit, micro-sized bowl of what seemed to be Goya Beef Bouillon is now being served up at Los Gallos. Literally, it is one-third of its traditional amount with a highly dubious broth to boot. To be honest, I was so offended by the size and broth that I didn't even get to try the guts of it before I asked for a refund. The size of this $8.50 cup of soup is an insult to any CESJ-eatin' fool. Too bad...this used to be amongst the best and most respected BOWLS in town. This is a cereal-bowl sized insult to the entire CESJ world. Having sampled another substandard-sized bowl of CESJ recently at Los Gallos (this time at their #2 location at 4252 South Archer Avenue), it’s worth mentioning that their broth this outing was nothing short of spectacular, being wonderfully balanced and having an elegant natural beefiness to it. I truly enjoyed every drop...in spite of still being hungry afterwards. Thank G-d for the Nicky's Hot Dogs (6142 S Archer Ave) down the road to help finish things off with their superbly constructed big baby. Instead of getting their regular accompanying bowl of dried chile de arbol, our waitress at Los Gallos presented us with some chili oil, also composed of toasted chile de arbol, which resembled something you would be more apt to find at a Chinese restaurant. I'm not at all sure this can readily be found in Mexican restaurants serving CESJ but I've never come across it before myself. But damn if it didn't elevate the whole experience! Anybody ever come across this stuff anywhere that serves CESJ? If you don't have a big appetite and also don't mind spending $8.50 for a micro-bowl of CESJ, go check out Los Gallos (#2 only?) with their homemade chile de arbol oil. 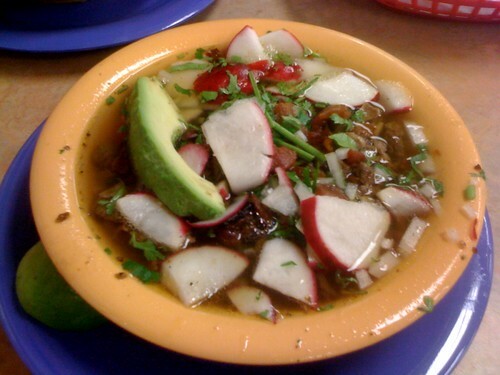 This past weekend at Taqueria San Jose they served me the same style of chili oil with my menudo. It defenitely added a welcome layer of flavor to the broth. I too had to ask and my waitress said chile de arbol and that they only make it for their menudo. The chile condiment you describe sounds exactly like what is typically served with fish and seafood soups in Puerto Vallarta and adjacent Nayarit. It struck me as completely Chinese, and the Asian influence on the foods of that part of the Pacific coast are obvious and well documented. Since PV is in Jalisco and the area is the holiday resort for Tapatios, I'd guess there's a connection. Nothing wrong with this bowl from Los Tres Gallos in Melrose Park two weeks ago, following on Amata's recent update. I also enjoyed a banana licuado and a birria taco (had wanted to try the full tatemada plate with consome, but the menu CESJ was $10 to start with; had to talk them down to a small bowl, which was still quite generous and $6.50). This was more like molten cow than usual. Particularly succulent beef and a serious slick of tallow on top of the bowl which could have been off-putting if it weren't so fresh and expertly spiced. Good garnish and plenty of thick-cut, barely crisped bacon this time. Homemade tortillas for that Friday. Los Gallos on Archer was my first and it certainly won't be my last. An amazing combination of ingredients, from the surface broth to the crispy bacon waiting underneath it. Wow. Probably my favorite dish of the year thus far. Eat it if you haven't already. Also, ask for a side of their chili oil. It's dense and flavorful with a bit of a kick. PIGMON referred to it as "mole-like" and I think that description is decent at best. I may have mentioned it earlier in the thread but I grew up around the corner from Los Gallos on Archer at Albany. They showed up in that location sometime in the early 90s (I think) and I became addicted to their carne en su jugo after I moved back in with my parents after a brief stint in LA. Outside of my own chicken soup, it's my favorite cold cure. I haven't had their soup in about 5 months but thanks for the tips on the changes (pricing and chili oil). It'll be interesting to see how things have changed. In the meantime, for those of you on the northwest side, I had the CESJ at Taqueria Poncitlan #5 at Roscoe and Cicero and it was as good (maybe?? -- need to do a proper taste test) as at Los Gallos 2. I don't think they gave me as much in the way of condiments as I recall as at Los Gallos 2, but it sounds like sizing may have changed their anyway. Definitely avoid El Paso #1 on Pigmon's initial list... I lived around the corner from there for about 2 years up to a few months ago and the place just didn't make sense to me. One day I'll get around to visiting some of the others. Santander wrote: Have you gotten to La Lupita to try the version with half a package of chopped Oscar Meyer hot dogs yet? La Lupita’s got some competition! Though are you sure those hot dogs are Oscar Meyer? I bet they are Fud brand dogs (pronounced "food")! You should have mentioned the grilled hot dog chunks in your post. I would have made it to Taqueria Poncitlan #5 (3400 N. Cicero Ave) within minutes of reading about it! I never thought my eyes would feast on grilled boloney or anything similar to it ever again after my one-time sighting at Taqueria el Tapatio #2 (4114 W. North Ave.) back in 2006 (haven’t had the pleasure of dining at La Lupita yet. Probably for my next birthday. Thanks for the lead, Santander ). Seriously, this soup had its highlights (a muddy but still fine not overly salty broth and nicely charred asada). But the non-crispy bacon, never-before-seen-in-a-bowl-of-CESJ bits of raw jalapeno, as well as the comically amusing mini-chunks of grilled hot dog lowered the overall enjoyibility. If I were you, whenever I get the urge for a solid bowl of CESJ, take the extra step and head back to your old neighborhood to hit Los Gallos #2 (4252 S. Archer Ave). Their clean, beefy/morrow-y broth and beautifully crisped bacon/asada coupled with a dab of chile oil (make sure to request this) make this bowl hard to top with the possible exception of Birrieria de la Torre at 6724 S Pulaski. Thanks for writing about this place, nonetheless. In August 2011 PIGMON wrote: Having sampled another substandard-sized bowl of CESJ recently at Los Gallos (this time at their #2 location at 4252 South Archer Avenue), it’s worth mentioning that their broth this outing was nothing short of spectacular, being wonderfully balanced and having an elegant natural beefiness to it. The portions at Los Gallos #2 seem to have returned to normal. The current bowl (now $9) ought to be enough for most appetites. And it's as good as ever. PIGMON wrote: Instead of getting their regular accompanying bowl of dried chile de arbol, our waitress at Los Gallos presented us with some chili oil, also composed of toasted chile de arbol, which resembled something you would be more apt to find at a Chinese restaurant. JeffB wrote: The chile condiment you describe sounds exactly like what is typically served with fish and seafood soups in Puerto Vallarta and adjacent Nayarit. It struck me as completely Chinese, and the Asian influence on the foods of that part of the Pacific coast are obvious and well documented. Since PV is in Jalisco and the area is the holiday resort for Tapatios, I'd guess there's a connection. Great stuff. I'm not familiar with the Puerto Vallarta condiment so I expected something more akin to Chinese la you but there's far less oil and it seems to contain toasted sesame seeds, giving it a nutty flavor. It's surely among the very best salsas/condiments in Chicago. Does anyone know if these Los Gallos outposts have any connection to El Gallo de Oro in Des Plaines? I had my first carne en su jugo there last month and I thought it was fantastic (recognizing that I have nothing to compare it to). jesteinf wrote: Does anyone know if these Los Gallos outposts have any connection to El Gallo de Oro in Des Plaines? No connection. In fact, it's also not even related to either of the El Gallo de Oro restaurants located in Chicago or in Worth. Intrigued by your maiden CESJ voyage, I decided to head up to Des Plaines this week for a bowl. Besides being a complete salt bomb, this soup had some respectable elements to it. Being of the seldom seen green (tomatillo) variety, I considered it a worthwhile trek just on that fact alone. If you can get around its uber-saltiness, the broth isn't half bad (although I did notice that not one of us present even came close to finishing it). Another liability was the poached, brisket-like meat instead of the more desirable carmelized grilled steak which will always beautifully reinforce any base broth. This is a common downfall of lesser versions of CESJ. They did a nice job of crispy-ing the bacon but an overuse of it didn’t help anything on the saltiness front. I always wondered whether overly salty CESJ comes from too much bacon and/or bouillon usage. Whatever the reason, I regrettably almost always forget to request less bacon just in case. Thanks for the heads up on this one, Mr. jesteinf. Last edited by PIGMON on November 12th, 2011, 5:34 pm, edited 1 time in total. jesteinf wrote: Does anyone know if these Los Gallos outposts have any connection to El Gallo de Oro in Des Plaines? I had my first carne en su jugo there last month and I thought it was fantastic (recognizing that I have nothing to compare it to). Better bowls of beefjuice await you. Rene G wrote: Better bowls of beefjuice await you. Maybe so but that's going to be a tough card to beat. Well, at the very least I'm glad I could give you guys another datapoint. El Gallo de Oro certainly isn't the greatest Mexican place in town, but it serves it's purpose when I have somewhere to be nearby (plus the people that work there couldn't be nicer). Given the faults you found with their carne en su jugo, I'm definitely looking forward to finding a better bowl. Having been stuck in a CESJ rut at the Los Gallos in Melrose Park, and on 26th street, I finally broke free and made it to #2. Excellent. I will ask for less bacon next time, as that was a bit overwhelming, and experiment with more condiments, but for this visit I wanted to try it as they dish it out. Excellent, clean flavor, aside from that excess of bacon, no greasiness and very generous garnishes. I also may try CESJ completely sin carne one of these days, as I was wondering as I ate this whether the rest of the soup might be more enjoyable without the profusion of asada and bacon. dicksond wrote: I also may try CESJ completely sin carne one of these days, as I was wondering as I ate this whether the rest of the soup might be more enjoyable without the profusion of asada and bacon. After hearing mention of carne en su jugo at the LTH picnic yesterday I did some digging around and found this glorious post. Really amazing stuff. I'm very excited to make some ventures to the south (and west) side this fall/winter to experience CESJ. On Tuesday I ran out for a quick take-out taco from one of West Chicago's Mexican restaurants only to discover they have a new name and a new special. A big hand written sign just inside the door advertised Carne en su Jugo (with avocado and radishes). I was told they started offering it about a month ago. As I was taking lunch back with me and it was a pretty warm day, I admit I didn't order the special. It's on my short list however. Details: The restaurant is now called "Mr. Papa's" and the menu features a picture of a mustachioed potato wearing a sombrero and laying on a beach blanket. He is accompanied by a big umbrella and a bucket of beers! Another stew version! It's hard to tell from this angle, but that's a very shallow dish... the same they use to serve the tortas ahogadas. It's not even an inch deep. I wonder, Pig, if there's any significance to the fact that the other stew version you found was also in the Southwest, or if it's just chance. Sadly, this is an underwhelming version. All of the elements involved are plainly evident. I thought the potato -- almost like home fries -- was an interesting addition, though I'm still unsure of whether or not I think it's a good one. Have you seen that before? The real tragedy here was the soup/stew, which wasn't the least bit beefy. It mostly just tasted and had the body of a light tomatillo salsa. The search continues, I guess. But it's nice to know that CESJ does, in fact, exist in the greater Phoenix area. PIGMON wrote: ...while visiting my parents in Palm Springs, California, the past few days gave me a chance to try another variation of this dish. After trying several different soup versions of CESJ in Chicago, it never occurred to me that it could possibly come in another style other than soup form. Popping into a random taqueria there (Cenaduria), I was surprised to discover that they offered carne en su jugo in 2 forms, either as a soup or a stew. Never seeing the stew form, I obviously opted for that. Instead of being a soupy broth, this version was a rich stew with a wonderfully beefy sauce. Besides the usual chopped meat, pinto beans, and grilled onion, the carne en su jugo contained nopales and cubes of uncured fresh bacon, things that I've never seen in versions here in Chicago. 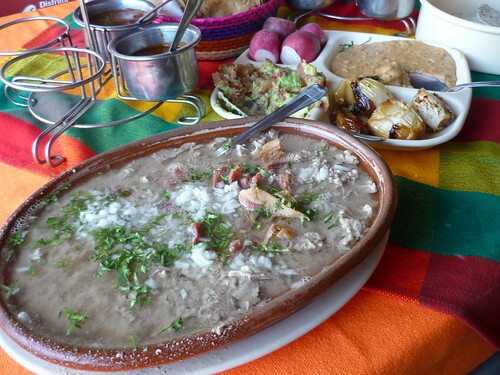 Our waitress, who was originally from Jalisco, said that carne en su jugo in stew form is very common there. Good question, Dom. I'm not really sure. What I do know for sure is that CESJ in soup form is obviously the dish of choice in Chicago and appears to be very much growing in popularity here over the last several years. 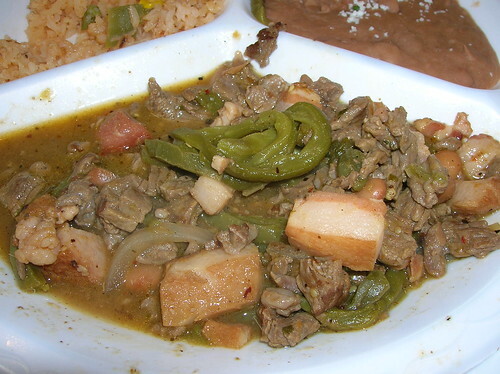 The alternative stew form (described by Rene G) found at Taqueria Los Gallos which they call "carne apache" (although not truly a ceviche-d, raw beef dish, as traditional carne apache typically is), is similar to what you found in AZ and what I once found at a random Cathedral City, CA cenaduria. Both Western versions (no, I've never seen potato usage before) looked to be served in shallow bowls as is Los Gallos' "carne apache". These versions seem to be nothing more than deconstructed, drier expressions of the more popular soup version of carne en su jugo commonly found. What I'd really like to know myself is how common is the stewed version in Guadalaraja? PIGMON wrote: What I'd really like to know myself is how common is the stewed version in Guadalaraja? I cant answer that from firsthand experience in Guadalajara but I did enjoy a bowl of CESJ while in Aquascalientes (next door to Jalisco) from a very, very popular place in Guadalajara called Los Originales. 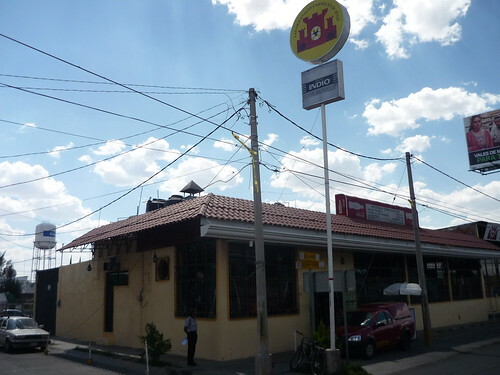 They've been around Guadalajara since 1972, the spot I was at in Aguascalientes since '78. There's another location in Cancun as well. I did a little research before heading to Mexico and asked folks when I was there where to go for the best CESJ and all signs pointed towards this place. So going there became my goal. It was really good and I remember them explaining that if I wanted to make it more of a stew like some in Guadalajara do then I should add the refried beans that came with the plate of fixings. Good stuff indeed and they couldn't believe this white boy from the states knew where to find it. Without this thread it's possible I would of never known about the soup let alone where to go in Mexico for it. Holla. I really wanted to stop and grab CESJ for lunch in Guadalajara as we rode a bus from Aguas' to Puerto Vallarta but people including those escorting us with weapons thought I was crazy. Dmnkly wrote: I thought the potato -- almost like home fries -- was an interesting addition, though I'm still unsure of whether or not I think it's a good one. Have you seen that before? I had some carne en su jugo with potatoes last year in Chicago. On Sundays, San Francisco de Asis hosts a market on the sidewalk outside the church and serves food in the church kitchen. I'm not really sure of the schedule. A few carts selling antojitos are set up outside while the more substantial food is served indoors (turn left before you enter the sanctuary). 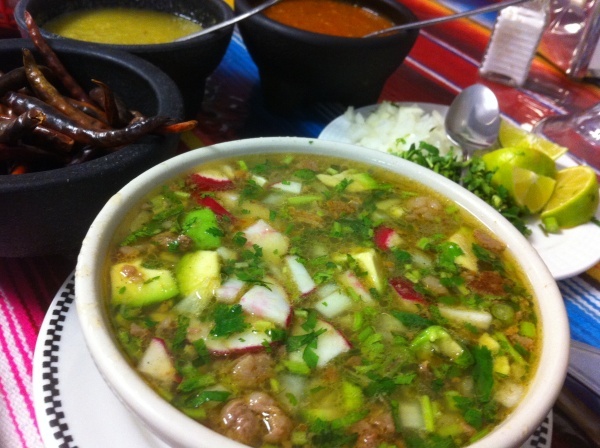 We tried carne en su jugo, menudo, sopa de albondigas (good) and a few small things. Carne en su jugo (con papas!) was certainly an unusual version, pleasant enough but memorable mostly for the spuds. Maybe worth seeking out if only to check off your list. There's probably some other interesting food at the church if you're willing to ask some questions. Did the vendor explicitly call that dish CESJ con papas? I ate something decent (what? God knows!) at that market last year while heading over to Baconfest 2011. Definitely didn't see that there. Thanks. PIGMON wrote: Did the vendor explicitly call that dish CESJ con papas? It was listed only as carne en su jugo on the menu board (in the kitchen inside the church on a Sunday). When I ordered it I had no idea it would contain potatoes. I wouldn't be surprised if the menu changes from week to week so I'm not sure how often it might be available. It was a decent bowl of soup but quite different from any other carne en su jugo I've had. Note the beans (roughly mashed) were served separately. Chef Mickey Neely at Scofflaw has constructed what I would call a near perfect green chicken variant of carne en su jugo. His base broth is no half-hearted effort having a sensational silky chicken lusciousness to it and is also enhanced with just the right amount of tomatillo. He, thankfully, also takes time to ultra-crisp ideally sized bacon shards. The soup is topped with pieces of high-grade grilled chicken and is not disbursed throughout the soup. By doing this, he's clearly displaying his confidence in the base broth, unlike most traditional chopped beef versions which often times have lost their textural integrity. And, not surprisingly, Mickey gracefully lets his patrons add their own ratio of garnishes (radish, avocado, onion, and cilantro). I think he accidently overlooked the chile de arbol but I'm betting by the next time I have another bowl (next week), it'll be included. My only complaint is that the ratio of bean-to-broth doesn't do justice to his stellar soup. More broth, less bean, I say! I'm not sure how long Scofflaw's planning on having this on their present menu. But if you like CESJ, this one is special and worth seeking out...even if you're a teetotaler. PIGMON wrote: Chef Mickey Neely at Scofflaw has constructed what I would call a near perfect green chicken variant of carne en su jugo. His base broth is no half-hearted effort having a sensational silky chicken lusciousness to it and is also enhanced with just the right amount of tomatillo. He, thankfully, also takes time to ultra-crisp ideally sized bacon shards. The soup is topped with pieces of high-grade grilled chicken and is not disbursed throughout the soup. By doing this, he's clearly displaying his confidence in the base broth, unlike most traditional chopped beef versions which often times have lost their textural integrity. And, not surprisingly, Mickey gracefully lets his patrons add their own ratio of garnishes (radish, avocado, onion, and cilantro). I think he accidently overlooked the chile de arbol but I'm betting by the next time I have another bowl (next week), it'll be included. Awesome, thanks. Need to make it in soon for some of this.